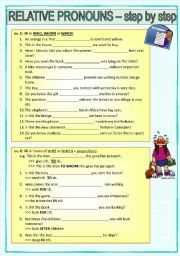 Hand out the map or copy it on on an overhead transparency and ask the students to use the phrases on the second page to practice asking and telling the way. 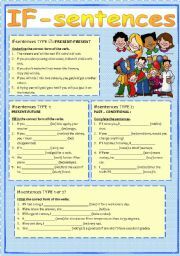 A second exercise checks accuracy: students fill in the missing words in different dialogues. Can be used at any level. 5 exercises to train the use of modal ability, possibility, permission or assumption, as well as the use of colloquial "can" and formal "may" for permission. 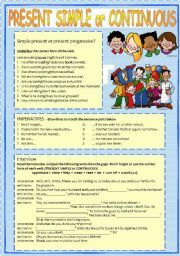 Elementary to intermediate level. Thanks to Philip Martin for his clipart. Level: upper intermediate to advanced. After a short introductory explanation, students practice the shortening of relative clauses either by using the present participle or the past participle as well as infinitive constructions. 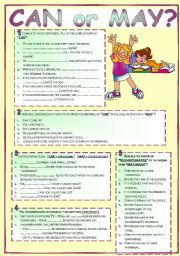 A structural worksheet guiding students through the exercises step by step. EX 1: Fill in WHO-WHOSE-WHOM-WHICH EX 2: rel.pron. with prepositions EX 3: defining/ non-defining rel.clauses (commas and the use of THAT) EX 4: omission of the rel.pron. Thanks to Philip Martin for the clipart. 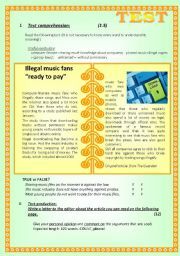 This test starts with a text comprehension on illegal music downloads(true or false), followed by a personal comment on a newspaper article (letter to the editor) on TV damaging the young. 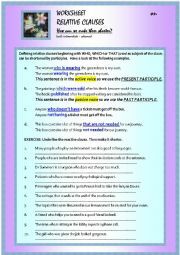 Then a grammar section (tenses; finding lexical mistakes) and a vocabulary task. KEY included. This guide is intended for advanced learners in business. It informs about posiitive and negative strategies and how to be a successful negotiator. 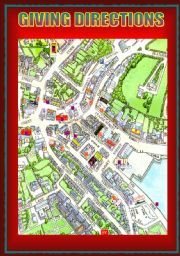 A easy-to-understand guide leading step-by-step to the correct layout: how to write dates, addresses, salutations and endings.